Sharing a more comprehensive update on Boracay... since I am writing an article for the Bonda magazine, I decided to update the same details here in my blog to give others a better indication of costs. A lot of people are afraid to go to the Philippines because of the different bad news, which they have heard over the years. Both my expatriate and Malaysian friends often tell me that they have heard of Boracay, yet only a handful have actually been there. They always mention that they have heard of its unrivaled beauty yet they are unclear of how to get there and if it is safe to go. Let me share with you in a moment why this place is a must-visit in this lifetime, and of course, how in the world will you get there. I grew up in the Philippines, hence back in the year 2000 onwards, when I started earning my own money, I was frequenting Boracay, almost twice in a year. Back then, we had to take smaller planes and the number of resorts was probably one-third of what they have today. March to April is the peak season for the locals (Filipinos) that would flock to the beautiful island mostly because of the Holy Week. Another peak period is Christmas time. 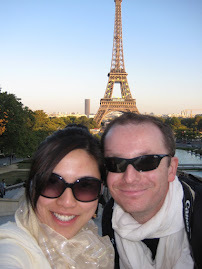 Last March 2012, I went to revisit the Philippines with hubby and my 2-year old daughter. We had engagements to attend to in Manila, so we planned ahead when we booked our Boracay flights and accommodations. The key to getting good prices in most cases is to book early. We booked our Manila to KL flights since January 2012, and we also booked our Boracay flights shortly after. My recommendation to families departing from Kuala Lumpur is to take Cebu Pacific flights. This is the low-cost carrier equivalent to Air Asia, except this is for the Philippines. The flight from KL to Manila takes about 3.5 hours. You will land in the airport called NAIA 3. Within the same airport, one will not need to transfer via car to move from International to Domestic. Instead, the transfer is just by foot. The tricky part is how to time your flights, because if you take a connecting flight and one of it is delayed, you are in trouble. That is where the travel insurance option becomes handy (when you are buying the ticket online, the option is available). For us, we have family in Manila, so we usually take a flight KL-Manila and spend some time there before flying off to Boracay. For tourist, you may want to just wait at the airport. Honestly, take the advice from someone who grew up in Manila, there is not much to see there… except for people who really want to shop or eat at good restaurants (in Makati). Otherwise, save all that vacation days and spend it in Boracay! Once you are in Manila, the flight to Boracay is just an hour. Be careful to note that there are usually 2 kinds of flight to Boracay. One is to Caticlan while the other is to Kalibo. You will want to take the CATICLAN flight because this means the plane lands closer to the beautiful Boracay island and that also means shorter travel time. Basically after a plane ride, you will need a short and transfer which takes 5-minutes and then you are at the port already. From the port you take a boat transfer which takes about 20-25 minutes, then another land transfer to the hotel of your choice. Last March, we took the 6:30am flight from Manila so by 8am we were practically ready to have our breakfast on the island! By now you are probably wondering why you should bother with all that travel just to get to Boracay? In all my travels to many beaches in the world, I have yet to find the perfect combination which Boracay offers: super fine white sand on the beach (so fine that you can walk barefoot at noon without getting burned), super clear waters where you practically see the fishes and clearly see your own pedicure), so clean that there are no rocky stuff to avoid nor corals that will harm your feet, and the beautiful sunshine that cooks up the right temperature for a cool dip – not too cold and not too warm. My travel to many parts of Thailand have proven that the water sometimes gets too “warm” because of the sun, while the sand in Indonesia never satisfies my high-standards for sand quality. And this is simply because I grew up in the Philippines! The island provides of all kinds of accommodation and cuisine. It is even complete with its own D’Mall, where you can find all sorts of things like souvenirs, ATM’s, alcohol, gourmet cheese shop, Havaianas flip-flop store, mini grocery, and more! I always convey this to friends: whether you are alone, with your loved one, with kids or big families, just the girlfriends nor with guy buddies, Boracay has something to offer each and every one. Whether you are young or old, on a budget or on a splurge-spree, low or high standards, there is a perfect place for you in Boracay. There are many activities like jet-ski, banana boat and my favorite of all, which one has to experience, is the sunset sailing with the traditional boats called “paraw”. It has no engine and solely relying on the wind. It gives you are beautiful view of Boracay and its unbeatable sunset. A boat ride could cost you different amount, of course depending on how good you negotiate and with whom you book your activity. I spoke to the men offering the service directly and you will usually find them on the beach offering their services. Wait, I mean, they will in fact probably find you first and come to offer you their services. 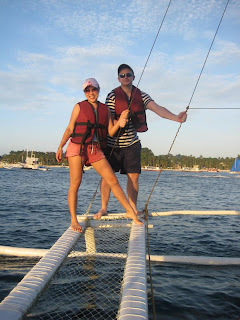 We paid PHP800 for the sunset cruise. Someone else tried to rip me off at PHP1,600 for one ride. Imagine that! The PHP800 gave us an hour sailing which usually should start around 5pm. The sunset in the Philippines is much earlier than in KL. The exchange rate for Philippines Peso from Ringgit is PHP14=RM1. Yes, that means your Ringgit is worth more money when travelling to the Philippines! For our accommodation, well, I have stayed in at least a dozen different hotels in the past. Until today, the range of accommodation is still increasing! After much research online, I opted of a new place, which is a boutique hotel that opened not too long ago. It is called Astoria Hotel in Station 1. The Boracay island is roughly split into 3 large areas called Stations. Station 1 is where the upscale and exclusive resorts are (and the beaches are wider and more scenic). In Station 2, you are closer to the action, where the access to D’Mall, other restaurants and activities will be easier. Many options for hotel, food, and other things. While Station 3 is known to be the cheaper end of the island where you will find the market and lower cost accommodation. You can choose to book straight with the resort’s website, or do like us, we booked Astoria via AsiaRooms.Com. Based on my experience, I would recommend hotels like: Astoria (for the boutique experience and newer feel), Discovery Shores (for the higher budget individuals who want a superb swimming pool and beautiful rooms, some have a private Jacuzzi), Seawind (for those who prefer a rustic yet luxurious stay), Tides (station 2, easy access, ultra-hip place for the younger crowd), and if you are really looking for exclusivity and privacy then go for Shangri-la (though it will be hard for you to access the other places as you need to travel by car). Food is easy to find, and they even have their own Starbucks Boracay already (which totally surprised me on my last visit). One thing you must indulge on when in Boracay is the mango shake. The mangoes in the Philippines are the best in the world! Try the mango shake (mixed with a bit of milk), everyone will surely love it! There are tons of other shakes like the Mango-Banana and other concoctions, which will leave you a lasting impression of the tropical island life. Judging from the number of tourists I saw, the popularity is growing! It seems to have picked up compared to my last 2010 visit. It is not a cheap holiday, as noted by an expat friend of mine. It is because of the flight you need to take from KL to Manila then another flight getting to Caticalan Boracay. However if you plan ahead, it can be affordable and definitely will be a superb getaway for the family. I would tend to say for a family of 3 people (parents with 1 child), you will need to budget about RM1,500 for the KL-Manila flights for all 3 pax (if you book on the sale period), the another RM1,200 for the Manila to Boracay flights for all three of you. Accommodation will be about RM500-1000 per night for the hotel stay, depending on the hotel type. Food can be cheap or pricey also depending on where you eat. We did an adventurous meal at Station 3 where they call the market “Talipapa”. That is where you can buy live seafood like lobsters, squid, fishes, and crabs. Then the surrounding restaurants can cook it for you with respective charges and you can choose from a diverse range of sauces and cooking styles. In our experience, there were 4 adults together, we had excessive seafood of all above-mentioned, and it costs us about RM250- which is a reasonable price for such a feast! this information help me so much!tq! Cheals is right! Thanks for sharing the information lovely mom! I am going to invade Boracay this coming christmas break and I can't wait! that's why it is better to plan and book your hotel in boracay in advance if you want to save your budget.